Exercises and Workouts to Lower Blood Pressure. Tips on weight management, blood pressure reduction and getting high energy. There are many people that have high blood pressure and don't even realize it. If left unchecked, high blood pressure can cause unwanted effects on your body such as artery and kidney damage. Don't let this happen to you. Start a simple exercise program and ward off the damaging effects of high blood pressure. Just by starting a simple exercise program, you can enjoy a lifestyle free from hypertension. Your blood pressure is measured by two numbers. The first number is the systolic pressure. This number tells you the pressure of your heart pumping blood throughout your body. The second number is the diastolic blood pressure. It indicates when the heart is idle in between each heartbeat. When doctors read these two numbers together they are read with the systolic pressure number before the diastolic pressure number. Basically, if you have any number reading that is over 120/80, you have high blood pressure. But don't worry. There is a possible solution to this problem. Start an exercise program. Exercise reduces high pressure. It is one of your best ways to keep you off of high blood pressure medicine. If your doctor has already prescribed blood pressure medicine, exercise will make it work even better. Working out and building up a good sweat, makes your body rid itself of salt, fat and water. As a result, your blood pressure is reduced. Fortunately, all exercise will lower your blood pressure. The best exercises to lower blood pressure will vary according to each individual. Make sure that your exercise program includes exercises that you will continue on a regular basis. It has to be something that you enjoy and will not quit two or three weeks down the road. Remember, in order to consistently ward off high blood pressure, you have to be willing to make a lifestyle change. Regular exercise must be a regular part of this lifestyle change. A few suggestions of exercises that will help to lower your blood pressure are walking, swimming, weight lifting, jogging and using your treadmill. Many people think that they have to spend unnecessary money on gym memberships in order to start exercise programs. This is not true. Exercise can be done anywhere. You can exercise in your own home by going up and down the stairs, doing everyday household chores, vacuuming the floors or washing windows. Find exercises that are simple and convenient. Follow a diet plan that has lean meats, fish, low-fat dairy, fruits and vegetables. Stay away from sodium at all costs. Salt has a very negative effect on your blood pressure. In addition, try to decrease your body weight by 10%. 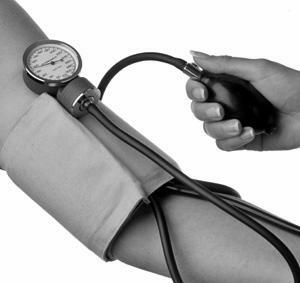 When you lose weight, your blood pressure is reduced. Be proactive and ward off high blood pressure. Start an exercise program, eat a moderate diet and commit to a healthy lifestyle. These three things will help youbeat high blood pressure. The provided content is for informational purposes only. Do not perceive this information as a substitute for your doctor's professional instruction. If you suspect that you have high blood pressure, please see your doctor at your earliest chance. Back to Weight Training Exercises and Workouts Tips Homepage.